Recovery requires a sea change, from autistic behavior to neurotypical, that as far as I can tell takes years under the best circumstances. There will be no single morning when Martin will wake up perceptibly different from the night before. True, we notice gradual alterations: moments when I remember some behavior Martin used to have that I haven’t witnessed in weeks; instances when Martin surprises us with a new skill, albeit one that won’t reappear again for months; once-daunting tasks, like clearing airport security, that Martin manages now with ease. And there are physical signs, such as sleeping and scratching. But for the most part Adrian and I operate on vague notions, such as whether the day passed easily, or how Martin “seemed,” or whether he carried himself like other kids. By yesterday Martin was exhausted, and sick of traveling, on our last in Argentina before the overnight flight back to New York. He was fussy and unreasonable. He insisted on being carried any distance longer than four feet. Still, he brought us joy. We had him dressed in a miniature Leo Messi jersey, which caused our lunchtime waiter to like him immediately. 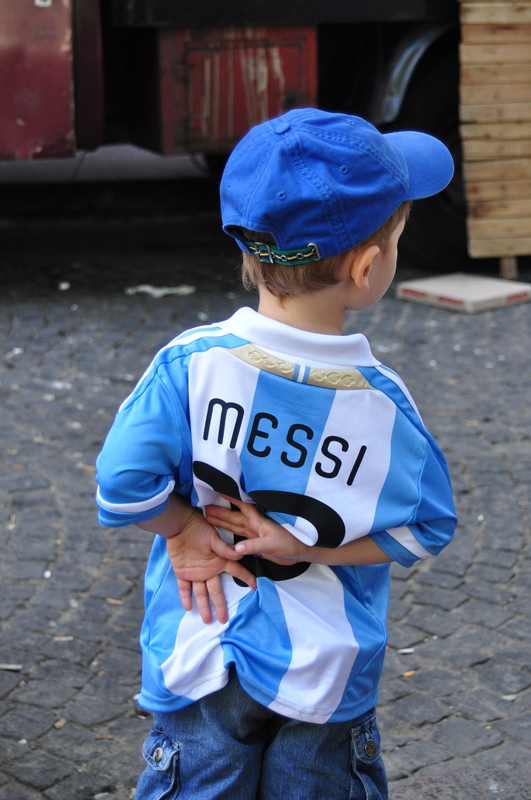 (The Messi-jersey trick, I’ve determined, works on nearly any Argentine. We’ve enjoyed repeated calls of “¡Qué precioso!” and “¡Hay viene el Lionelcito!”) The waiter doted on Martin, who smiled and ate with his fork like a big boy. After the check was settled, the waiter held out his hand to Martin and said, “¡Ciao, amigo!” Martin grasped the offered hand, made firm eye contact with the waiter, and replied solemnly, “Ciao.” It was another of those like-any-kid interactions. Where am I going with this post? I don’t really know, as I don’t truly know where we’re headed with recovery. I guess I want to say that things are looking up. But it never pays to get ahead of myself. That’s a recipe for heartache.